Walking into a good bookstore calms my soul. In my nerdy, book-loving opinion, nothing beats the smell of paper and ink (and occasional mustiness), the sounds of murmured conversations, and the feel of the weight of a book as I try to imagine myself reading it. Luckily for me, I live close to Elliott Bay Books in Seattle, one of the finest independent booksellers in the country. And, in a rare stroke of genius, I’ve managed to orchestrate a monthly family trip there by inventing a book-of-the-month club for my husband and children. Usually it doesn’t take long for me to find a book on our outings, but what I prefer is when a book finds me. This happened during our last trip to the bookstore. I was well inside the store, past the tables where books are laid about in seductive poses and into the section where the books are lined up in a more dignified manner on the shelves. And there it was: Everything is its own reward by Paul Madonna. 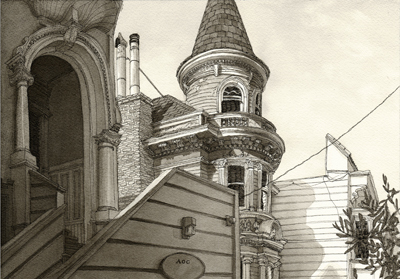 On the cover is an ink-and-watercolor-wash drawing of an ornate San Francisco turret, a snapshot view from an unexpected angle. I could not resist picking it up and found that the book has the same size, heft, and solid hardcover as a really good sketchbook. A quick flip through the pages revealed that it was a sketchbook on the inside too, each page covered with detailed architectural renderings and handwritten notes. A finely-polished sketchbook. I stopped looking, cradled it in my arms and brought it home before I let myself have second thoughts. I managed to find some time to curl up with it later that afternoon and realized that the words on the drawings were not simply notes, but were snippets of conversation, aphorisms, entire flash-fiction stories. 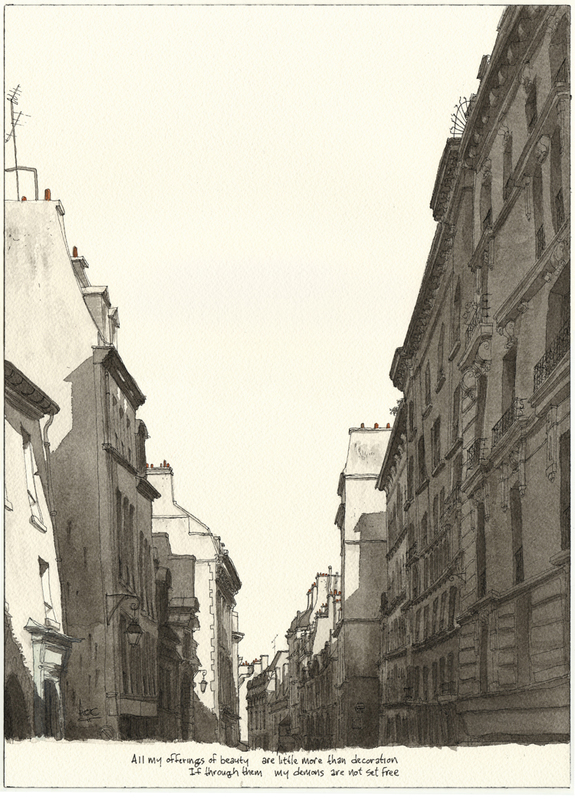 Each highly-crafted drawing is coupled with a literary nugget just as compelling as the ink-wash drawings. Image used with permission of author. 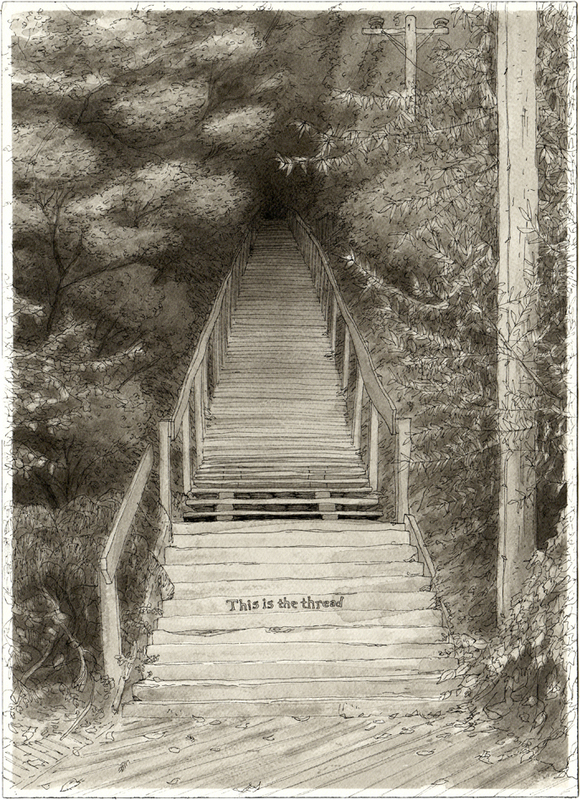 Go ahead, try to draw a staircase that nice. You can’t do it. Most of us have a hard time seeing a staircase that nice. I will be repeating this phrase to myself as I write. And I am pleased to learn that Paul Madonna has quite a deep body of work. Turns out this book is a narrative compilation of a weekly strip, All Over Coffee, he publishes in the San Francisco Chronicle. AND (hooray for me), this is his second book. Thanks to Elliott Bay Books, I have new inspiration. No offense, Amazon, but that has never happened to me by clicking a mouse. Some people run to stay sane. Others get massages or do cool things with yarn or clay. Karen writes. She’ll write anything: short stories, long and rambling novels, on-line parenting articles, letters of complaint, and short autobiographies for websites. After decades of being too shy to talk to most people, she has a lot of pent-up conversation in her head which is really helpful every year when NaNoWriMo comes around. She was the second place winner for Young Adult fiction in the 2011 Pacific Northwest Writers Association literary contest, and the first place winner of the 2010 Write on the River Writer’s Competition for fiction. She is currently pursuing a Master in Teaching and has been known to dabble in architecture. This looks like an awesome book, Karen. I, too, find inspiration from visuals. Great post! The combination of text and images in that book is breathtaking. Thanks for the peek!